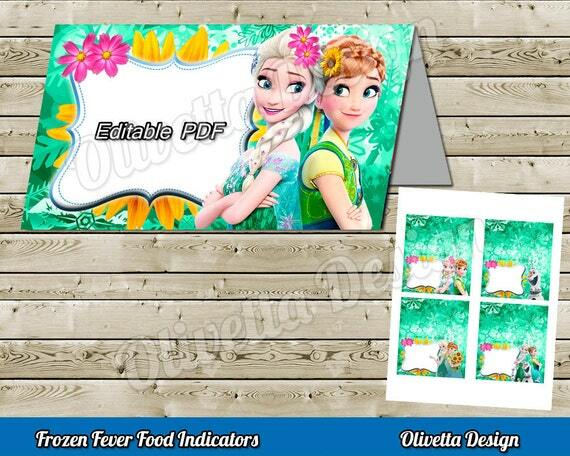 Frozen Fever EDITABLE Food Tent Food Label BIRTHDAY party Printable Instant Download - 4 Models Included! Thank you for stopping by, please kindly read all the instruction before making any purchase. This is an INSTANT DONWLOAD, and you have to download it from Etsy one you made the purchase. This listing is only for the food indicators. 1. Purchase the design and check out via Paypal. • You will receive one 8.5x11 inches EDITABLE PDF file ready to print. with 4 differents models Each label measures 3.5x2 inches (folded). The file can be printed on white paper, or cardstock on 8.5 x 11” paper. You can then cut with scissors or paper trimmer. More Frozen Fever items here, if you need another item, just convo! Simply save/download the file to your computer, USB flash drive or disk. From there you can print to your home computer, upload to an online printing vendor or take into a printing vendor to have printed for you. PLEASE READ: Please keep in mind that cell phone providers and iPad providers tend to condense/reduce attachments/files sizes. This may be due to the storage space allotted on the devices. Not sure. This may cause issues (and has with previous clients) when trying to upload to an online printing vendor as the file will no longer be the original 300DPI file size (huge) required by online printing vendors. This is an issue with your provider and is not reflected on the actual file size emailed to you by me. My recommendation is to upload/download the file(s) from a computer to eliminate this issue.